Description du Nil de ses sources de son cours depuis les cataractes jusques au Caire avec une carte tres exacte de ce fleuve & des environs copiee sur celle qui a ete dessinee sur les lieux et presentee depuis au roy de France Louis XIV. 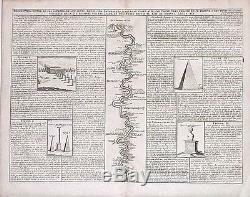 A fine folio engraving centred on the river Nile (with north at the bottom), stretching from the 1st cataract at Aswan to Cairo with accomanying text. On either side of the engraving are further inset engravings and explanatory texts of 1. The Temple of Isis at Aswan, 2. Small pyramids up to 70 feet in height, 3. Large pyramids up to 1400 feet in height and 4. He lived consecutively in Paris, St. He is best known as a Dutch cartographer and more specifically for his cartographic contribution in the seminal seven volume Atlas Historique, published in Amsterdam between 1705 and 1720. Innovative for its time, the Atlas Historique combined fine engraving and artwork with scholarly studies of geography, history, ethnology, heraldry, and cosmography. Some scholarship suggests that the Atlas Historique was not exclusively compiled by Henri Chatelain, as is commonly believed, but rather was a family enterprise involving Henri, his father Zacharie d. 1723 and his brother, also Zacharie (1690 1754). They worked as a partnership publishing the Atlas under several different Chatelain imprints, depending on the Chatelain family partnerships at the time of publication. The atlas was published in seven volumes between 1705 and 1720, with a second edition appearing in 1732. The maps were accompanied by information pertaining to cosmography, geography, history, chronology, genealogy, topography, heraldry, and costume of the world. The images incorporated into the plates and tables were drawn from the best available contemporary sources, including the works of Dapper, Chardin, de Bruyn and Le Hay. Many of the maps are based on the work of Guillaume de l'Lisle. The sheet is evenly aged toned, commensurate with its age. Minor tears, if any, have been mended with archival tissue. The attached photo is part of the item description, please examine carefully. Size (h x w): 44.0 x 52.5 cm. The item "Antique map, Description du Nil" is in sale since Thursday, April 30, 2015. This item is in the category "Antiques\Maps, Atlases & Globes\Africa Maps". The seller is "boden_antique_maps" and is located in Chichester. This item can be shipped worldwide.